Then, in March 2005, the system achieved 45kW. Hitting 67kW, said SSHCL programme manager Bob Yamamoto, meant 100kW was now within reach. "I know of no other solid state laser that has achieved 67kW of average output power," Dr Yamamoto, from the Lawrence Livermore National Laboratory in California, told BBC News. "We believe we hold the world's record for this." The news was announced at an army science conference in Orlando, Florida, and reported by the website Defensetech.org. The US military has been researching laser weaponry since the 1960s. But the technology has struggled to live up to high hopes; directed energy weapons projects have failed to enter the battlefield, for a variety of reasons. Chemically powered lasers have been able to achieve megawatts (one megawatt=one million watts) of power. But they are large and heavy, and require a constant supply of chemical fuel. Solid state lasers may lack this power potential, but they tend to be more compact and lightweight, holding promise for the eventual development of a mobile, vehicle-mounted weapon. "We have a lot of power coming out considering this is a very small system," said Dr Yamamoto. "In our 25kW configuration and our 2.5 sq cm spot size on a one-inch thick steel target, we blow a hole through it in seven seconds." SSHCL uses an array of many diodes - not dissimilar to the LEDs used in bicycle lights and remote controls - to generate a beam. Chilled water is piped through the diode array and other components of the laser to cool it down during operation. SSHCL generates a pulsed beam which fires 200 times a second at a wavelength of one micron. However, other experts place more stock in a continuous wave (CW), or "always-on", beam format. Dr Yamamoto said the power required of directed energy weapons depended very much on the task: "If you have an improvised explosive device (IED), exposed by the roadside in Baghdad, detonating that device in five seconds or 15 seconds is not such an issue," he said. "You could have - for example - a 25kW laser and have it dwell a little longer on the target. "Conversely, if you have a katyusha rocket that you are trying to engage three or four kilometres away, having more power is a useful thing. Maybe 100kW in that application is exactly what you want. He added: "More power on one level equates to a quicker response on the target you are trying to destroy." On a good day, said Dr Yamamoto, a 100kW solid state laser with reasonable beam quality could have a range of several kilometres. The team believes that a 100kW mobile version of the laser could be contained in a 9m- (30ft-) long trailer. The effectiveness of directed energy systems is affected by many variables. These can include atmospheric conditions, turbulence (changes in air density as the result of heating and cooling), humidity, clouds, the time of day, and, of course, the nature of the target. Perhaps the most successful of the US military's laser projects has been the Tactical High Energy Laser (THEL), which has shot down a small arsenal of mortars and rockets in live tests. THEL, built by defence giant Northrop Grumman, uses a highly focused, high-power laser beam to engage and destroy aerial targets. Another high-profile system currently under development is the US Air Force's Airborne Laser (ABL), which is designed to destroy enemy missiles shortly after they have been launched. The megawatt class chemical laser is to be carried aboard a modified Boeing 747 freighter aircraft. One of the biggest hurdles to surmount for solid state lasers is achieving a sufficient beam quality. This is a measure of how tightly a laser beam can be focused under certain conditions. Dr Yamamoto said improving the beam quality was one of the current goals for his team. The Livermore group is one of a number working on solid state lasers and is looking for further funding. 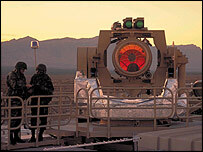 In 2005, Massachusetts-based Textron Systems and Northrop Grumman became the only two firms so far selected by the US to develop solid-state lasers for the military. The programme's goal is to develop a 100kW solid state laser by 2010. How hot is the heat-ray gun?